During the last three years on RedNation Online I have done a season preview for each Canadian MLS club and an end of the season review looking at how the season played out, comparing it with my preseason analysis, and explaining what each club should do in my opinion to prepare for the next season. This year is the first time I get to write about three playoff teams, which is very much a positive outcome. However, all three Canadian clubs need to improve to challenge for the MLS Cup and secure themselves as a top franchises in the league. Although I might have the most to say about Toronto FC, I think it’s unfair to both the Montreal Impact and Vancouver Whitecaps to not talk about Toronto first, as they are the most disappointing team of the three. Yes, they are a club who did make the playoffs for the first time in their history, but have yet to play a playoff game at home, which Vancouver and Montreal both accomplished this season. Prior to the season I predicted Toronto to finish fourth in the Eastern Conference, and it turned out to be the case that it was a very competitive Eastern Conference, where the Reds actually finished in sixth place. The key questions when being critical of Toronto FC in 2015 is what did we expect from the club and should we give them credit for actually making the playoffs and showing signs of being a competitive club in the league? Being based in Toronto, attending games, speaking with Toronto FC fans and pundits, and being a guest a number of times on the ESSU podcast, does give me a different perspective and relationship with TFC than I have with any club in the world. To ownership’s credit, the resources they put into the club has allowed me to experience great soccer moments in my hometown, highlighted this season by Sebastian Giovinco’s goal against the New York Red Bulls to secure Toronto FC their first playoff spot. Although if you look at the franchise and what their key executives and marketing department promote, it’s very easy to say that this club has failed in almost every component of the game and that they are only competitive because of a willingness to throw money at situations. In 2015 this is underscored by the play of Sebastian Giovinco, without whom we could be talking about a club not in the playoffs and behind two recent expansion teams in the league. For me, the most concerning aspect of Toronto FC is the opinion of the club among people deeply involved in North American Soccer who I have been able to develop relationships with. Off the record, to a tee, they all still look at Toronto FC and the development of the club as the laughing stock of MLS. Admittedly, many of these contacts are American and don't, in my opinion, understand the culture of soccer in Canada or the work being done at the grassroots level of our country. They feel Toronto FC is devaluing American resources and players such as Michael Bradley and Jozy Altidore, who some think would be better off not in Toronto. Whereas myself, and I think many Toronto FC supporters, could argue Toronto FC would be better off without them. That being said, I think most of the criticism is deserved and even with making the playoffs in 2015 questions could be raised about why people in charge of the club are still in those roles. It is always easy in MLS to look at the performance of the DP players and judge the club performance based on how they played. I think this is not the case and, as we see from the 2015 MLS Playoffs, high priced DP's do not guarantee you success in today's MLS. If we look at Toronto's DPs and compare them to what I thought going into the season, I think they performed as expected. In the case of Giovinco, even though I thought he would have a very impactful season, including scoring double digits goals and assists, I don't think I or anyone else could of projected a 22 goals and 15 assists season performance. As you can read in my Analytical Preview for TFC in 2015, I projected Jozy Altidore would score 13 goals this season and by season’s end he had scored 13 goals, which ended up being the 10th most in the league and two goals more than Jermaine Defoe scored last season. So my take on Jozy is probably higher than most others opinion on his performance during the 2015 season. Although as I wrote when Toronto signed Altidore, this is who he is, a great finisher, and a good overall forward at the MLS level. Arguably, if a team designed a system where he was more of a target man he could score 20 goals a season in this league. Which brings up Michael Bradley, who I have easily been the most critical of. In my preview I said he was not only the Toronto FC 2015 poster boy but also will be the greatest difference between success and failure. While Bradley improved offensively this season, hitting the back of the net five times and also adding six assists, the ongoing concern is how the team plays overall when he is on the pitch versus not. Once again, Toronto struggled when Bradley was in the starting eleven, losing three more than they won, and the team also showed better offense as unit when Bradley didn't play, scoring 19 goals in eight games. As you can see by the scouting report, I have never been critical of Bradley's core attributes and I feel he has one of the best engines in the game. What he is not is an offensive threat and where he has cost Toronto FC since joining the club is taking offensive chances - be it shots, corners or free kicks, which statistically would be more successful if others took his place. Because he spends so much time on the offensive side of the ball it, hurts the club defensively, as most times he was put in the starting lineup as a defensive midfielder. Beyond the DP's, there was a lot of positive play from other players in the Toronto roster. Marco Delgado, as I also predicted, turned out to be a good signing from Chivas USA and he has great upside as a 20 year old, although as a winger and not a right back where he was used in some situations. A year ago I was critical of Jonathan Osorio for not offering enough when he was on the pitch, and he improved this season taking more shots and involving himself more in the game, although he still needs to take greater chances on offense and be more active defensively. If he does so, he can be a player Toronto FC builds around for the future. Benoit Cheyrou also provided exactly what was expected of him and if you compare his performance statistically, he had a similar impact as Bradley in most games. Cheyrou will be 35 next year, but I feel he can still provide an asset to the club if he wishes to return in the same salary range. Justin Morrow was steady, although he did give the ball up too many times. Ashtone Morgan looked good when he played and he should have been given more minutes during the season. Collen Warner, Jackson and Eriq Zavaleta provided good depth when asked to perform, enough in my view to return next season, although especially in Jackson's case, they could be replaced by more effective players. Rookies Jay Chapman and Clement Simonin looked good in limited play and are players who should remain on the bench in 2016 but could be given a greater amount of minutes. 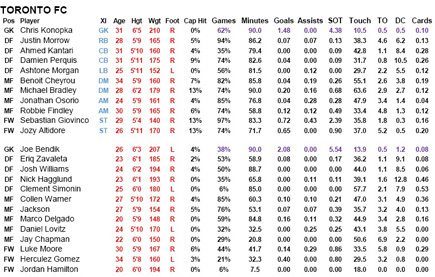 Of the rest of the players I wouldn't be overly critical of Chris Konopka, Joe Bendik, Nick Hagglund, Daniel Lovitz, and Herculez Gomez's performances in 2015, although at the same time I think improvements could be brought in. In terms of goalkeepers, I would give homegrown player Quillan Roberts a chance during preseason to earn the job as starter, or at least have him as my backup and combine Konopka and Bendik’s salary to bring in a more proven keeper. To Hagglund, Lovitz, and Gomez’s credit, they are American, although I feel they could be replaced by better drafting and recruiting at lower expected salary costs. I might even put the others in the same category, as I don't feel Damien Perquis, Ahmed Kantari, Josh Williams, Luke Moore or Robbie Findley played horribly when given minutes, but I do feel based on the salaries they were given they under performed. Of the five, and against the opinions of others, I would give Perquis the greatest benefit of the doubt, as I think some of his poor play could be connected to being new to the league and how the current Toronto FC team is structured, as he does provide grit which many other players on the club lack. If I was in charge of TFC I would give greater opportunities to younger players such as Skylar Thomas at center back, Jay Chapman or Chris Mannella in the midfield and Jordan Hamilton upfront. This would create greater cap room and allow Toronto FC to sign a central defender and another attacking option close to a DP salary. Overall this season I have no issues regarding player recruitment at a 1st team level and understood and gave credit to the team for bringing in established players and spending the money to do so. The failures with the club on this end goes back years ago in not properly developing a good core group of players and allowing players with potential such as a Sam Cronin, Luis Silva or Joao Plata leave the club for practically nothing. My biggest criticism of Toronto is, as always, how the team is sold to the public, and the more I learn, the fear that team management itself believes it. Ian Clarke and I spent a whole hour before the playoff game with one idea being repeated: adapt to Montreal in the post season and don't let Drogba beat you. Interestingly, it was Montreal who followed our idea playing the suggested three holding midfielders taking Giovinco out of the game and beating Toronto FC soundly. 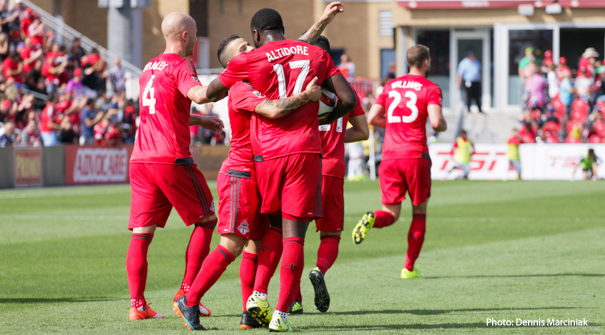 Many points were lost throughout the season for similar reasons and maybe outside of only New York City FC and the Chicago Fire, Toronto FC looked the least cohesive team throughout the 2015 season. The biggest issue is neither Toronto FC or anyone involved with the club has ever taken responsibility for their failures - and this does not include the firing of people because they never learn based on the new people then brought in. I want Greg Vanney to succeed as manager. I personally like how he wants to develop and play younger players and his willingness to go for it in games. However, I've also seen Toronto FC be totally out coached in games where I can only put most of the blame on Vanney. I care less about Tim Bezbatchenko and new team President Bill Manning, but I would at least give them credit if they were accountable for their failures and gave an honest opinion to Toronto FC supporters on how they are going to make the team better. I'm a Toronto FC supporter, but what I can't support is being treated as if I'm stupid. This is how I feel Toronto FC sells the team and many decisions to their audience. Beyond the objective analysis the criticism, I would guess this shows I care, howver a warning for Toronto FC going forward (and as they've seen in the past), even that can disappear.